Scaley Monte Carlo, chomping at the bit. Mr. Kennedy, I hope that you can get your hands on one of the Monte Carlos and do a sort of evaluation and test of this new car. Being in the Middle of NASCAR Country and having been a race fan from the days of Buck Baker, Bob, Tim and Fonty Flock I can not wait to add in my racing stable as a companion to my Scaley #90 Donleavy Ford. I think this could be a possible home run with the help of aftermarket decal makers. Dave, I do have one question, depending on the sales of the Monte Carlo do you think that there might be more NASCAR type cars in the "Pipe Line"? Such as the 70s Monte Carlos, 80s T Birds and perhaps other styles that dominated that era of NASCAR racing? I hate cars with no running mate... take that for as much as I can say at the moment. At the moment we will not be doing actual liveries of racing teams... so only cars in "familiar colors" will be done because the teams who used certain sponsors at the time will not/cannot give us permissions to do the exact racing sponsors. I (we) would prefer to do another type of car and not another Monte Carlo of another year at this point. At the moment the expected release date of these car(s) and set is Sept of this year. At the moment there will be 1 set and 1 solo car released this year. The set cars will be black window cars with no interior, but the solo car WILL have an interior and clear windows. I DO have a sample of the car here at my home office. I WILL have the car with me when I (plan to attend) the Michigan 24 hour race. During that weekend I expect that the guys from Slot Car Corner/Cloverleaf Racing/Slot Car Corner Canada will measure the wheels so that Quick Slicks can be made PRIOR to the release of the cars this year. Dagnabit... I (most likely) won't be there that weekend! 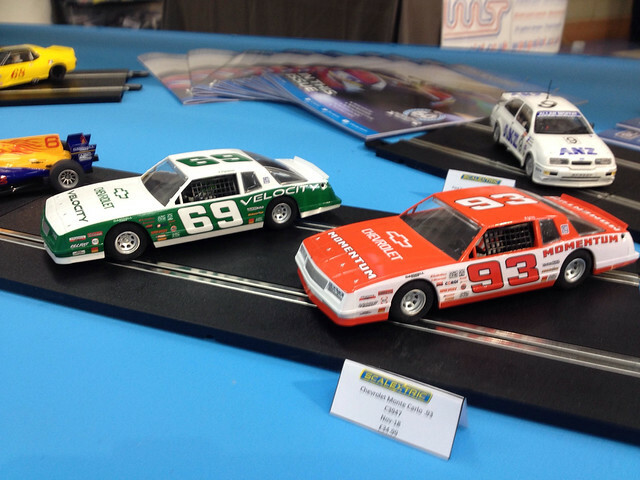 A preview photo of the new C3947 (green) - C3949 (red) Stock Cars that will be released later this year. These will be the solo cars (meaning not in a set). Cars are interesting with lots of potential. 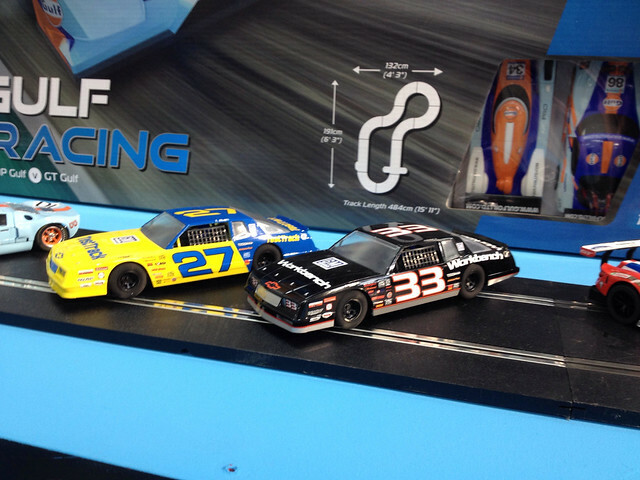 The first pair of cars will be released in the set. I'm sooooo excited to get these on the track. Great looking cars for sure. I'm not taking credit for these... they were planned before I got here. Dave, We love our Jobs here at Hornby America!!!! Yes, Eddie... yes we do. All times are GMT-8. This page was generated at 09:31 AM.